Your continued kindness and support helps make Richmond one of the safest cities in the country for homeless animals. 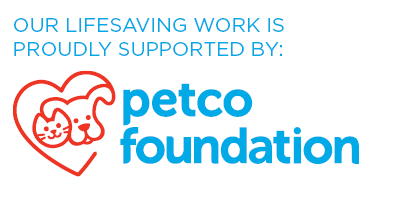 Thank you for guaranteeing a bright future to pets in need! Gifts to our Annual Fund support important lifesaving programs and services for orphaned animals and are put to work immediately in the area of greatest need. Gifts to our Cinderella Fund sustain a designated pool of resources that enables the Richmond SPCA to assist those homeless pets with extreme illness or injury, or animals too young to survive without around-the-clock care and attention. Gifts to our Spay/Neuter Fund help the Richmond SPCA to continue providing the Richmond community with free and low-cost spay and neuter surgeries and vaccinations. Gifts to our Anne Grier Fund for Abused Animals aid pets at the Richmond SPCA who are in need of special rehabilitative care due to the abuse or neglect of a previous owner. This fund is named in honor of longtime Richmond SPCA board member and supporter Anne Grier. Gifts to this fund help support the daily operations of our low-cost, full-service veterinary hospital. Gifts to our Snap’s Community Education Fund benefit a special pool of resources that provide the financial foundation to deliver important humane messages to the public through educational outreach. This fund is named in honor of a small cat named Snap who became the inspiration for our CEO Robin Starr to lead the Richmond SPCA to become a local and national leader in humane achievement on behalf of homeless animals. The Board of Zoning Appeals in Henrico County has ruled that caring for feral cats in a residential zone is not a permitted use. This ruling is in direct opposition to the compassionate, reasonable care and management of feral cats. This defense fund supports the Richmond SPCA’s ongoing legal appeal associated with this ruling as well as the Richmond SPCA-supported appeal of any violations issued to individual caretakers. This fund was established in honor of Susan Mills and her heroic efforts to protect her group of feral cats in Henrico County. A dear supporter of the Richmond SPCA, Pat Manning, experienced the goodbyes every person who has loved a pet dreads when her dear companion, Katie, passed away in 2012 and her faithful friend, Gus, passed away in 2016. When Pat took Katie and Gus into her home she enrolled them both in training classes at the Richmond SPCA, where Katie and Gus both thrived. As a tribute to her dogs who were loved so well and learned with such zeal, we have created the Katie and Gus Manning Memorial Scholarship Fund that will provide access to training services that will benefit future dogs like them, keeping them in their homes and building stronger bonds with their guardians. You can be a part of our Circle of Care and help provide a happy ending for the homeless pets at the Richmond SPCA. Your continued kindness and support helps make Richmond one of the safest cities in the country for homeless animals. Your gift at the Jeremy’s Club level honors the beloved pet of Richmond SPCA benefactor Ellen Glasgow (April 22, 1873 – November 21, 1945). Glasgow was a Pulitzer Prize winning American novelist from Richmond. Beginning in 1897, Glasgow wrote 20 novels and many short stories, mainly about life in Virginia. A supporter of the Richmond SPCA since the year after its founding in 1891, Glasgow became vice president of the organization in 1911 and president in 1924. She was president at the time of her passing in 1945. Your gift at the Glasgow Society level honors Ellen Anderson Gholson Glasgow (April 22, 1873 – November 21, 1945). Miss Glasgow was a Pulitzer Prize winning American novelist from Richmond. Beginning in 1897, Miss Glasgow wrote 20 novels and many short stories, mainly about life in Virginia. A supporter of the Richmond SPCA since the year after its founding in 1891, Miss Glasgow became vice president of the organization in 1911 and president in 1924. She was president at the time of her passing in 1945. This giving society is named in honor of Nellie Nalle Palmer, who raised both funds and enthusiasm for the establishment of the Richmond SPCA after becoming aware of the growing national humane movement after the Civil War. Nellie worked for nearly a decade to inspire enough support to found the organization, which happened at a meeting at her and spouse Ben Palmer’s home in October of 1891. This giving society is named in honor of the Richmond SPCA’s past and current Chairman of the Board of Directors. The leadership and vision of dynamic Chairmen have helped to shape the nationally recognized organization we are today. Our Chairman’s Circle donors are also helping to lead the Richmond SPCA through their generous donations. Joseph Bryan Founders ($10,000+)This generous group of supporters is named for Joseph Bryan, an influential civic and business leader in Richmond in the late 1800’s who led the founding of the Richmond SPCA in 1891. Members of the Joseph Bryan Founders exhibit a special dedication to the Richmond SPCA through their leadership gifts. Friends who include the Richmond SPCA in their long-term charitable planning are recognized as members of our Legacy Society (link to legacy giving).